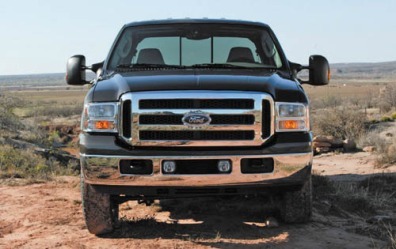 Warranty Comments: For styles that are equipped with the 6.0L Power Stroke Diesel V8 engine, there is a 5 year/100,000 mile warranty that applies to the engine. Includes manually telescoping manual sideview mirrors with two-way folding mirror. Recommended for climates reaching -10F or below. Includes four (4) LT265/70R17E all-season, black sidewall tires and one (1) matching spare tire. Includes electronic trailer brake controller integrated into the instrument panel, that provides audio/visual warnings if trailer becomes disconnected. Includes service front springs (200 lbs. upgrade above the spring computer selected as a consequence of options chosen. Not included if maximum springs have been computer selected as standard equipment), rear stabilizer bar, and auxiliary springs. Includes heavy service front springs and rear stabilizer bar. Includes four (4) LT245/75R17E all-terrain, black sidewall tires and one (1) matching spare tire. Includes 6.0L V8 turbo diesel engine with 325 hp @ 3300 rpm and 570 lb-ft of torque @ 2,000 rpm and engine block heater. 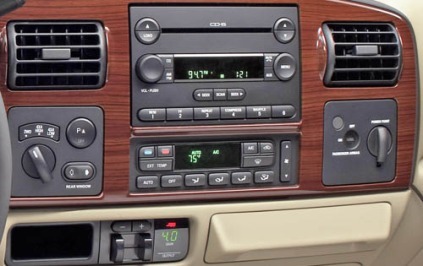 Includes electronic AM/FM stereo with single CD player and clock. Includes 3-valve 6.8L V10 gas engine with 362 hp @ 4750 rpm and 457 lb-ft of torque @ 3,250 rpm. Includes four (4) switches that can be used to control aftermarket features such as snow plows, auxiliary lights, etc. Includes accessory delay, power locks, power windows, one-touch down driver's side window and power fold away black mirrors. Includes transmission power take-off provision. Requires aftermarket power take-off accessories. Power take-off unit may be obstructed by catalyst placement on 5.4L and 6.8L gas engines. Forced on Power Stroke diesel engines. 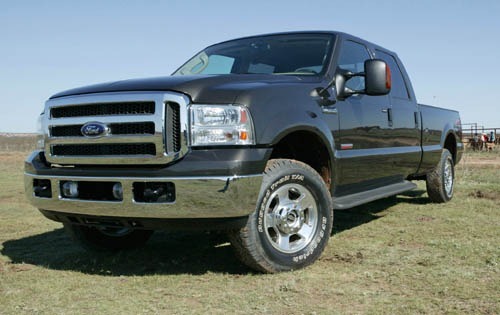 Available as a Fleet only option on all F-250 vehicles with gas engines. Includes heavy service front springs, rear stabilizer bar, slide-in camper certification and auxiliary springs. Required on all units ordered by dealers for California Emissions States registrations when vehicles are being delivered to non-California Emissions, non-Cross-Border States locations. Also requires 422 California Emissions System. Control code for units either shipped to California Emissions States dealers or ordered by California Emissions States dealers for registration in non-California States location. Not available on Power Stroke diesel engines. Includes heavy service front springs, steering damper and auxiliary springs (with 5.4L). Recommended only on vehicles that will permanently utilize aftermarket equipment such as heavy duty winches, brush guards or other apparatus that loads the front axle to the specified gross axle weight rating (GAWR). 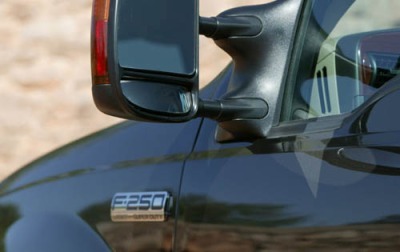 Includes manually telescoping power sideview mirrors with two-way folding mirror. Includes transfer case and fuel tank skid plates, Rancho branded front and rear shocks, steering damper and "FX4" decal. Includes computer selected springs for snow plow application and 140A alternator (with 6.0L diesel engine). Restrictions apply - see Supplemental Reference or Body Builders Layout Book for details. Includes four (4) LT265/70R17E all-terrain, black sidewall tires and one (1) matching spare tire. Includes transfer case and fuel tank skid plates. Includes auto-manual locking hubs and rotary control on instrument panel. Includes integrated black-molded cab steps. Only available on units sold to authorized governmental units and privately owned ambulance companies. Must also use Code 423 when ordering. Includes chrome front and rear step bumper, dual beam jewel effect headlamps, underhood engine compartment light and bright chrome hub covers with center ornaments.